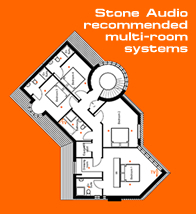 stoneaudio.co.uk - a high-end hi-fi shop with a difference! Come and visit the UK’s finest hi-fi, home cinema and multi-room showroom in Poole, Dorset, England. We are a specialist high-end audio company dedicated to offering you the very best in hi-fi, home cinema & multi-room audio and video equipment. Free from ties or purchasing restrictions we continuously select what we truly believe to be the finest audio and video equipment available. The Finest does not always mean the most expensive! We are perhaps more notable for what you cannot buy. Using this website there are many ways of finding the hi-fi, home cinema and multi-room items you’re looking for. Search, browse by product type or manufacturer using the menu on the left of your screen. If you need some expert advice or simply can't find what you are looking for then please do contact our friendly and knowledgeable staff via telephone, email or even Live Chat. Our website employs the latest secure server technology, ensuring that your personal details remain just that. Backed by knowledgeable people who care, you will find it hard to believe that you ever bought your specialist high end audio and video equipment elsewhere.